Air Pistol | THERMO Spoken Here! The greatly simplified sketch depicts a loaded "air pistol." The chamber of the pistol contains air compressed to 3 MPa. The "trigger" is a pin that constrains the bullet in the barrel. When the pin is pulled, the bullet is released and the compressed air expands to expel it from the barrel into the surrounding atmosphere. For simplicity, we assume the surrounding air pressure to be nearly zero and that a "firing event" experiences no friction, in any manner. Use the data of the sketch. Calculate the maximum velocity the bullet might attain. ♦ The usual procedure in problem solving is to select a system, then write the energy equation and inspect terms one at a time. All but one term of the energy equation must be specifiable so that the equation can be solved for that one term. With experience, the energy equation, by writing it, will indicate what to do next. In addition, it is usually the case that the largest, most encompassing system selection proves to be the easiest path to a solution (or it fails). To "shoot" the pistol involves both the air and the bullet, so we take both substances to be the system. We write the energy equation. The air is an ideal gas. (2) ♦ What does this look like? What does this look like? What does this look like? All of the information available has been applied, yet we see our single equation has three unknown quantities: the second temperature of the air, Tair,2, the exiting velocity of the bullet, vbullet,2 and the effect of friction. When we set friction to equal zero (to investigate the ideal process) we still are unable to proceed there being two unknowns and one equation. Our problem cannot be solved. We must select a smaller system. The above equation describes the relation between temperature and specific volume of an ideal gas as it expands without friction and without heat. The relationship or path is called reversible adiabatic. The result is important; its development deserves its own section. Frictionless Adiabatic Expansion: The result of this derivation, within this example to gives it focus, is general. The first step is to remove the integrals from the above equation, thereby changing the equation to differential form; a first order differential equation that applies to the air of the pistol. The superscript asterisk (*) reminds us that the system substance is an ideal gas. To fire the pistol is to release the bullet and thereby permit the air to shove it from the barrel. The place of action of the air pressure-force is over the rear area of the bullet. For the air to continue to push the bullet, it must flow quickly from the large chamber into the narrow pistol barrel. The friction of this flow (loss of pressure with local temperature increase) occurs in two manners. Flow friction occurs to the moving air as it passes the stationary steel of the chamber and inside the small diameter barrel. Additionally there is friction interior to the air as some of it moves before the rest moves, particularly as the air rounds the sharp-edged entrance to enters the barrel. Friction causes the pressure of the air within the chamber to be greater than the pressure it exerts on the rear of the bullet, pB. Frictional effects are very difficult to quantify. At this level, once again, we are obliged to assume no friction which is to assume the air pressure decreases uniformly throughout the entire chamber and barrel during firing of the bullet. That assumption means we assume pB = p for all stages of expansion of the air. With the assumption, frictionless, we obtain a simple differential equation for the event of the air, an approximation of the real event. The first step in solution of a differential equation is to separate variables. The air, an ideal gas, obeys the equation: pv = (R/M)T. With this we replace p on the right side with T and v. Separation is complete with one more step: division of the equation by T. Then we integrate definitely. Rules of natural logarithms are used to transform the expression above right. The result is a relation between T and v for a gas process path that is frictionless and adiabatic (below right). Our immediate result has T and v as variables. Substitutions (using the gas equation with a workout in dealing with exponents) yield equation forms with T and p and another with p and v as variables. These are included for completeness. Our derivation concluded, we return to Air Pistol. The result of the derivation can be used to specify T2,air. The left-most result applies the air pistol. 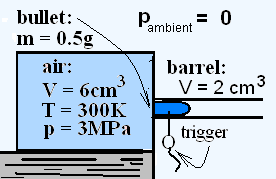 Entering numbers, the second temperature of the air is determined to be 267 K.
Now (with friction set to zero) it is possible to solve for the maximum exiting velocity of the bullet.